During the mid-nineteenth century a number of Wendish families from Lusatia chose to emigrate, many to Australia. Why did the Wends emigrate? Some reasons which have emerged for this emigration include issues in Europe such as feudalism, famine, fighting, factions and faith. (a) The end of feudalism placed many peasant farmers from the hands of the land lord into the hands of the money lenders. In either case, the farmer could not feel free or independent. Capitalism clearly had its drawbacks. (b) Famines involving potato rot in 1845 and 1846, as well as excessive heat and failed crops in 1844 and 1845 brought much hardship to the wendish farmers. (c) Fighting and warfare was a common feature of European political history and war and conscription were never far from sight. (d) Factions in the political realm arose between conservative royalists and more liberal democrats, culminating in the 1848 Revolution, which Christiane Hiller, nee Petschel, refers to in her Memoirs as she passed through Berlin on her way to Australia in 1848. (e) Faith in religious doctrines was a most intensely felt issue amongst some. There were those sympathetic to the State Church, those Old Lutherans more loyal to the Lutheran Confessions and the more emotional pietists who insisted on experienced conversion. In the case of the earlier issue of uniting the Reformed and Lutheran traditions instigated by Friedrich Wilhelm III, this may still have been in the minds of some as they considered their possible moves overseas to new lands of freedom. (f) Travel and tour agents like Mr Hakert spread the word around Lower Lusatia about previous successful journeys to new lands and a better education amongst the Wends enabled them to be more aware of such geographical places and to read the reports about them in their local Wendish papers. Most trips were one-way tickets but some obviously planned for a round-the-world return trip after savouring the antipodes. Certainly Carl Hoehne returned home more miserable but exceedingly wiser. (g) Transport through the newly opened rail system to Hamburg and through sailing ships to overseas locations was becoming more reliable and efficient. (h) A terminus or destination in the Antipodes called Australia beckoned the Wends as they read the good news from this land of freedom and hope which was flowing back to Lusatia. No doubt most emigrants left with mixed feelings. There was regret about what they had to leave behind, probably never to see again, but there was also hope, excitement and anticipation at what lay ahead for them on some far distant shore. Groups of Wends sailed to Australia from 1848 onwards. Sailing ships named the Alfred, the Australian andPeter Godeffroy arrived in 1848 with passengers who had to supply their own bedding, cutlery and crockery. Food supplied by the shipping Company included sauerkraut, potatoes, salt meat and herrings, cheese, dried fruit, rice, tea and coffee. Drinking water often became stale and fresh water was sometimes caught on an out-stretched sail. In 1850, the ship San Francisco arrived in Adelaide where many of the immigrants moved to Hope Valley and later in 1854 to Peters Hill. Also in 1850, the ship Prebislav arrived in Melbourne, where some Wends settled at Westgarthtown or Thomastown north of Melbourne. The Helene in 1851 conveyed a large group of Wends to Port Adelaide. 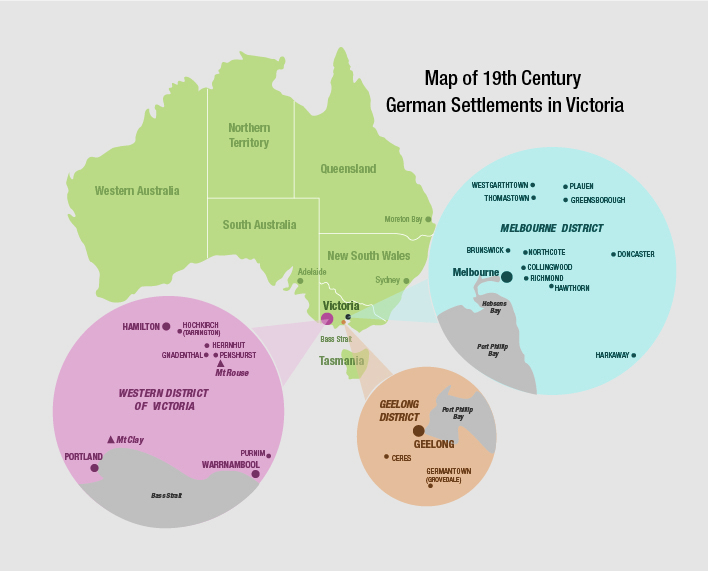 They first settled at Rosenthal/Rosedale in South Australia and then after harvest, some, including the Albert, Burger, Deutscher, Mirtschin and Urban families, moved on to Portland and then to Penshurst, Gnadenthal and Hochkirch/Tarrington in Western Victoria. The Malvina Vidal and the Steinwarder in 1854 brought more groups of Wends to Melbourne and Adelaide, with some Malvina Vidal passengers going from Melbourne to Adelaide on the ship Havilah. As passengers sought places to settle, some found temporary homes in Klemzig, Hope Valley, Blumberg (Birdwood) or Rosenthal (Rosedale). Ebenezer located north of the Barossa Valley in 1852 became the new home of most of the Helene passengers who were Saxon Wends, including the families Dallwitz, Hennersdorf, Kleinig, Lieschke, Lowke, Mickan, Pannach, Wenke, J. Urban and J. Zwar. Peters Hill was the destination of many of the San Francisco passengers who were Prussian Wends in 1854, including families Borrack, Duldig, Groch, Hondow, Huppatz, Noack, Petatz, Proposch, Schuppan, Teschner and Zerna. From here, some moved on to larger farms on Yorke Peninsula, Eyre Peninsula, the River Murray and the Wimmera-Mallee in Victoria. St Kitts and surrounding Neukirch-Dutton were settled in about 1855 by Saxon and Silesian Wends from Upper Lusatia, including families Bartsch, Biar, Biele, Bobach, Braunack, Burdack, Damschke, Doecke, Gersch, Eckert, Freund, Jenke, Kilian, Kleinig, Lieschke, Lehmann, Noack, Prochno, Pose and Schauschik. Bethany was the home of the Pechs. Hoffnungsthal or Valley of Hope near Lyndoch attracted the families of Dahlitz, Gassan, Gorman, Gniel, Kappler, Kilian, Lehmann, Noack, Matuschka, Miatke, Proposch, Pumpa and Schuppan. From the 1860s onwards, some of the above or their sons needed more land so they moved to new areas being opened up in South Australia around Port Lincoln, Yorketown, Saddleworth, Tanunda, Emu Downs, Appila, Booleroo Centre, Quorn and Hawker. Some moved to the Wimmera-Mallee region in Victoria, some moved to the WallaWalla and Henty districts in New South Wales and some moved north to Queensland. This pattern of wendish internal migration and settlement clearly illustrates the growth of Australia’s expanding agricultural frontier. However, it is now clear that this agricultural frontier was too extensive, when we consider the insufficient rain for dry farming, the drift sand and the rising salt with the raising of the underground water-table in some unsuitable areas where large tracts of land were cleared of their bushes and trees. Those farmers, including wendish descendants, who are engaged in tree-planting are helping to rectify this. See the A–Z List of Surnames, of Wends who emigrated to Australia in the mid 19th Century.